Sometimes we can get really hung up on words. Take “Palm” Sunday for example. Yes, it was a practice in Palestine in Jesus’ time to use palm branches to welcome dignitaries. Yet, when looking through a reputable Bible translation, only the gospel according to John specifically names palm branches. In the same translation, Matthew mentions branches, Mark mentions leafy branches (or greenery), and Luke doesn’t mention branches at all. The point of the text – and our ritual practice nowadays on Palm Sunday – is not the type of plant, but the purpose of the action. The people of Jerusalem were welcoming a King. We too give glory, praise and honour to our King. While many of us are used to doing this by using palms, some use olive branches (remember that Jesus entered Jerusalem via the Mount of Olives), while people in other parts of the world today would use what is available to them. So this year, on Palm Sunday, we invite you to bring your own cutting of a branch, from any tree or plant, to use as we commemorate Jesus’ entry into Jerusalem. We would also greatly appreciate it if you can bring some palms or some other branches for people who don’t have any. In this way, we can make the honouring and praising of Christ, our King, very much our own in this place and time. 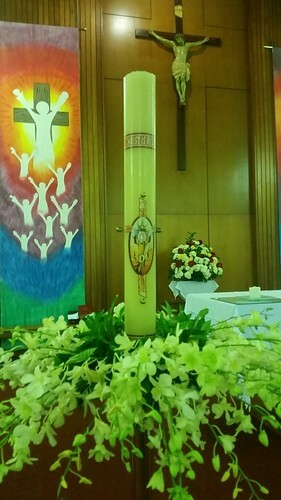 Throughout the season of Easter, the paschal candle is given a prominent and special place near the ambo or altar of the church. The candle is lit at the Easter Vigil Mass each year as the primary symbol of the light of Christ breaking through the darkness of death and sin. It features the Risen Christ bursting forth from the tomb in glory! Artists down through the centuries have used the image of the tombstone shattering to symbolize the energy, passion, power and sheer joy of the Resurrection moment for Christ and all humankind. Gone is darkness and death! Gone our Lenten fast and discipline! NEW LIFE bursts forth, filling the void with light, joy, feasting, celebration and the singing of Alleluias! “Easter in us” … Easter in our world! Alleluia! be a dayspring to the dimness of us. 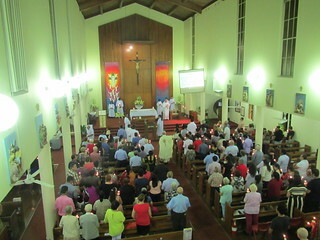 One way in which we mark the Easter Season in the celebration of the Sunday Mass at Wentworthville is by using the rite of sprinkling of holy water. When it is celebrated, it takes the place of the usual Penitential Act in the Introductory Rites. As the texts used for this rite make clear, sprinkling holy water is intended to remind us of our baptism. Through baptism, we are freed from sin and share in the death and resurrection of Jesus Christ, which we celebrate particularly during this season. During this Year of Grace, we have been invited to revisit the constitutions of the Second Vatican Council, which began fifty years ago this year. The first of these constitutions was on the liturgy, Sacrosanctum Concilium. In the opening paragraphs of the constitution, the Church sought to make clear some foundational principles. Firstly, the liturgy is the work of Christ and his Church. In the liturgy, we, the people of God, are made holy through “signs perceptible to the senses” (such as bread and wine which become the Body and Blood of Christ). Christ is made present in the Mass, not only through the consecrated bread and wine, but also through the proclaimed Word, the entire people of God assembled, and the person of the priest. In the celebration of the liturgy here on earth, we are given a foretaste of the heavenly liturgy, to which we all aspire and journey towards. One of the key statements made in the constitution is that the liturgy is the source and summit of Christian life. We come to Mass to celebrate and give thanks to God for all that we experience in our lives. We are also nourished and inspired to go out into the world again and live out the mission of Christ. Other aspects of Christian life may help to sustain us outside of the liturgy, but nothing else is as essential as the liturgy, particularly the Mass.